After growing up in the south where she was “homeschooled for hippie reasons”, Felicia moved to Hollywood to pursue her dream of becoming an actress and was immediately typecast as a crazy cat-lady secretary. But Felicia’s misadventures in Hollywood led her to produce her own web series, own her own production company, and become an Internet star. Maybe you picked this up because you watched Buffy that one time and wanted to know what that red-headed chick that wasn’t Willow was all about… or more likely, you are a fan of one of her many endeavors (and why shouldn’t you be?). She is a super-hardworking person who seems to be doing what she loves, and in my humble opinion, completely killing it. She shares her awkwardness and how even she fangirls when meeting famous people she loves. How can I describe this book? Imagine talking to your best friend about everything in your life: your childhood, your hopes and fears, and most importantly all things geeky (comics, video games, and the internet). That is how I felt when I was reading this book. Yes, I was a fan of Felicia’s already but reading this book felt more like talking to your best friend than some impersonal narrative that you just picked up off the shelf at random. Felicia is witty, funny, and down to earth. (A bit neurotic, her words, but we still love her for it.) 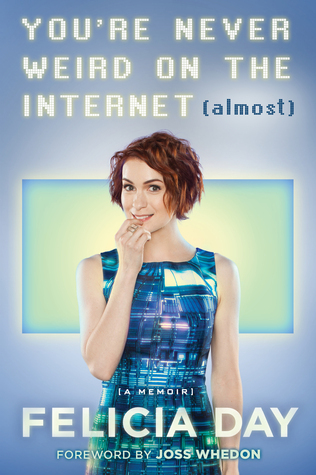 Her candor is endearing and makes the book incredibly relatable. Her love of video games, comics, crafting and just the simple art of creating definitely speaks to her readers (I know I definitely relate). Plus, the pictures peppered throughout are just adorable. She took her life into her own hands and with an incredible amount of hard work, created Geek & Sundry. She filled the book with her life and quite a few really good pieces of advice (as well as motivational phrases). As I sit here in my exploding TARDIS skirt (thank you mom for helping me make it), embracing my quirkiness and inner geek, I hope Felicia would be proud. I hope that people are inspired by her book, like I am inspired and take a chance. Do what they love. Check out all of her projects with Geek & Sundry, as well as past projects like my love Dr. Horrible’s Sing-Along Blog, the show that started it all the Guild and her appearances on Supernatural! And if anyone could get me a signed copy of her book, I would love you forever. I take my book collection very seriously and would love to have this sitting on my shelf (rather than residing digitally in the nethersphere of my kindle.) Random fun fact, one of my exes and I used to sing My Eyes. I, of course, sang Penny’s part (and when I was alone I would also be Dr. Horrible, duh). It was my favourite song from the show and I’m still obsessed with it. I also found it on Sing (karaoke app, I spend too much time on there) just so that I could record it as a duet (and then sing both parts because why not?). Enough about me, go buy her wonderful book immediately and read it.